An Australian school recently put a ban on all cartwheels, handstands, somersaults and other gymnastic tumbles during recess. Why? School administrators say that a child might get hurt performing these gymnastics without proper supervision. (It is a wonder how any of us survived recess as kids.) Fortunately, some parents have raised such a stink about this, that the rule is under review. 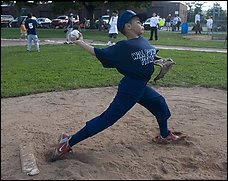 Meanwhile, in New Haven, CT, some parents are upset by a 9-year-old baseball player named Jericho Scott. Jericho is not being allowed to play baseball in the local league because his pitches are too fast. Even though his pitches are accurate and have never hurt anyone, parents insist that Jericho should not be allowed to play. Why? Parents say that their children might become frightened or get discouraged by facing pitches that they can't hit. I apparently lived a very dangerous childhood.